 However, while this is likely to remain the basis for much of what the Panthers do defensively in 2018, there is reason to think that this year might also feature something a little different. The first clue Panthers fans got to this was when the Panthers drafted Marquise Haynes – a player without a clear position in a 4-3 defense – in this year’s draft. Soon after drafting him Rivera talked, albeit briefly, about how Haynes would be a natural fit for their ‘joker’ role, and while the Panthers have dropped defensive ends into coverage from a base 4-3 in the past, it seemed odd that they would draft a player simply to perform this role unless they had something a little bigger planned than the occasional DE dropback. Which there are hints that they do. Of course, we won’t get a full look at the new look Panthers’ defense until the Cowboys game on Sunday, as teams tend to keep their cards close to their chests during the preseason – but even from what Eric Washington was willing to put on tape, there were some noticeable differences from previous Panthers’ defenses. The plays explored here are those from the first halves of the Panthers’ first three preseason games, with the playbook likely being simplified for the bottom sections of the roster spots in order to minimize mental errors and allow for more effective evaluation of individual players. Here, the other defensive linemen apart from Addison are all lined up as usual, with Addison himself taking a wider stance but still attacking the same gap just from a standing position. 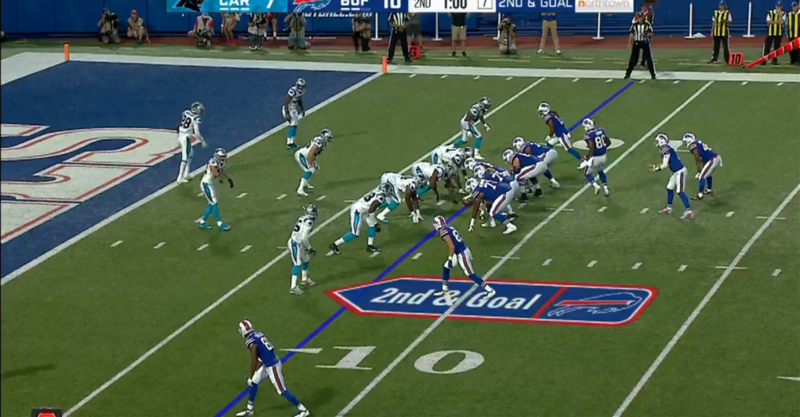 On this play, the Panthers bring Kuechly and Thompson on a double A-gap blitz with Addison coming off the edge and man coverage on the back end, the result of the play is an offensive pass interference call against the tight end. 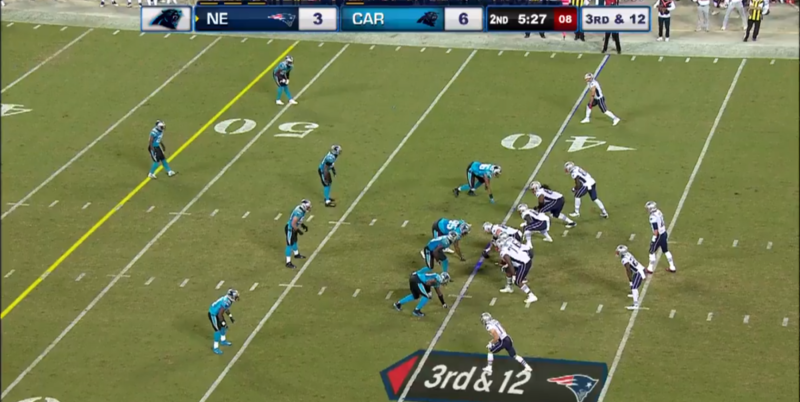 They also ran a near-identical play against the Patriots, withe result being a PBU by Adams on an outside go route. While these plays gained almost nothing from the slight kink to the defense, by putting the defensive end in a position where he can easily drop into coverage, Eric Washington allows the defense to hide where it is bringing pressure from, and who is dropping. This is something that will be dealt with in more detail later. The other relatively minor way in which Washington looked to modify the defensive formation throughout the preseason was to shift one tackle outside as an edge rusher, shifting the other tackle over the center and then moving the displaced defensive end as a interior stand-up rusher. From now on, for sake of clarity, such stand-up defensive ends will be referred to as ‘jokers’, the term the Panthers themselves seem to use for the role. From this shifted formation, the Panthers are then able to line the joker up either on the side of the natural end or the natural tackle. Here, the tackle lined up outside the far side isn’t expected to generate pressure, rather to force a block and prevent the offensive line from shifting away from him. The key player here is actually Kyle Love, who is able to force the double team by working on the gap between the center and the right guard – this leaves a two-on-two on the near side, with the speed of the two defensive ends giving them a distinct edge when the end shifts inside onto the guard. The effectiveness of the play is also helped by Obada selling the outside rush for as long as he does, giving the joker time to set up the stunt. Of course, if the offensive line knows the stunt is coming, they can look to shift the blocks so that the center looks to help inside on the stunt with the right guard being asked to block the nose tackle one-on-one, though Love does an excellent job of hesitating, rather than looking to fire into the A gap, which makes it harder for the center to shift off of him without risking giving up inside pressure. Here, the Panthers try and generate a three-on-three matchup on the near side, with Horton doing what he can on the far side. 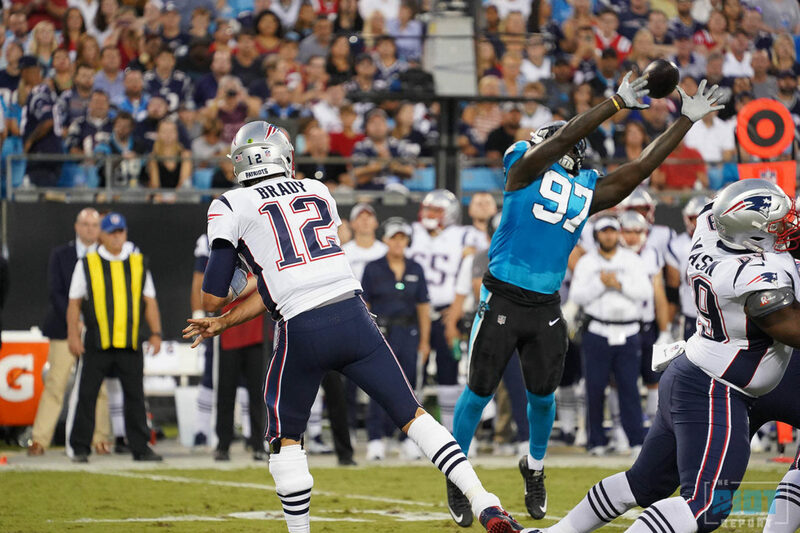 While this doesn’t go completely wrong, the Panthers are unable to generate pressure and the Patriots are able to convert the long third down due to what appears to be a blown assignment by Captain Munnerlyn – although one can’t be sure of that. 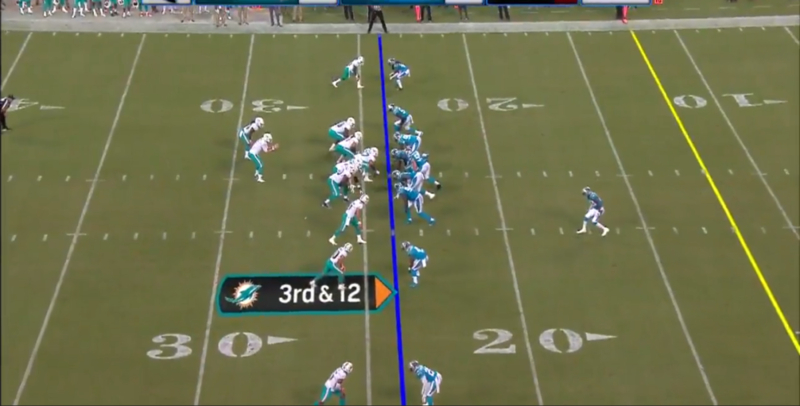 It would be foolish to try and make any sweeping statement based on two plays, but this formation looks to be a scheme in itself as any potential additional blitzers are well away from the line of scrimmage. 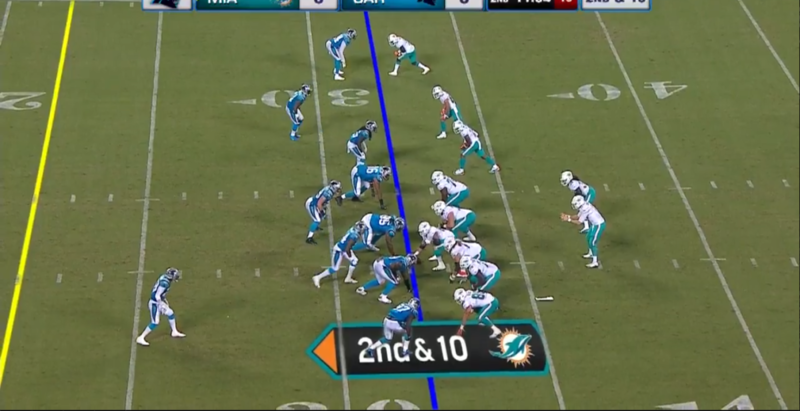 How the Panthers plan to use this formation remains to be seen, but it would be far from a surprise to see this formation a feature going forward; the other potential advantage of this formation that the Panthers are yet to use it the ability of the joker to jump the nose tackle; something to watch for during the regular season opener. As seems to be the standard for the Panthers this preseason, the Panthers formation here has one deep safety with a split safety over the tight end, and Kuechly, who is covering the running back, lined up over the A gap as a faux-blitzer. In reality, the Panthers ran man coverage across the board, with Davis, the rush linebacker, coming off the edge and Kuechly blitzing when the running back stays in to pass protect, the result being an incompletion on a miscommunication with the far-side receiver. However, the thing to note here is not what the Panthers did, but rather what they could have done. On any given play, the offense’s worries can largely be split into two categories: what the coverage is and who might be coming on a blitz/dropping off the line. On any given play, the defense will always do it’s best to disguise the coverage, with varying levels of success, but it is often much harder to disguise any potential blitzers; any linebacker who lines up far off the line is going to take a while to get to the quarterback – that is where the 3-4 defense has an advantage. 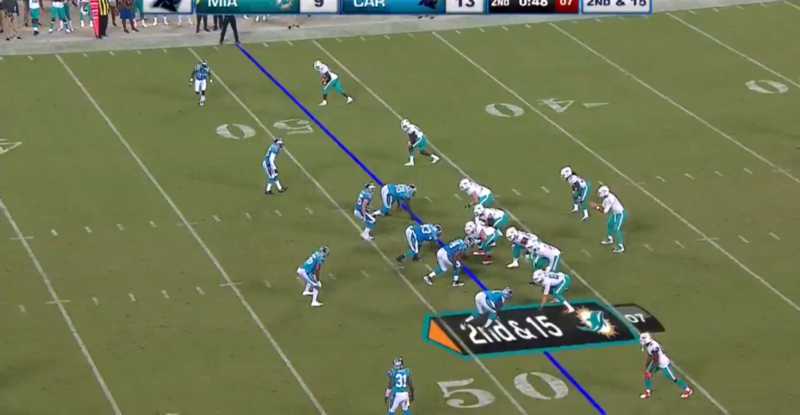 On the play above, the Panthers have three down linemen and three linebackers – if you include the joker. The Panthers can therefore bring anywhere from three to six pass rushers from the same formation, with any combination of the linebackers dropping into a variety of coverages. The extent to which the Panthers will use this new-found flexibility is hard to tell, but if used correctly, these 3-4 looks have the potential to develop the Panthers pass rush beyond the limitations of the base 4-3 defense. While much of this has looked at the scheme implications of the joker role, all of this relies on the roster containing players who are able to fulfill this role. In Marquis Haynes, the Panthers potentially have themselves a player perfectly suited – athletically at least – to what they ask from the position. Namely, the ability to act as an effective rusher off the edge, with the speed and lateral agility to drop back into zone should the play demand. Whether Haynes will be able to develop his technique in order to fully fit the role of the joker in the Panthers’ defense is yet to be seen, but if he can, this could be more than the occasional rep, but rather the basis for a new layer to the Panthers’ third down defense.